The blueprint of every living thing on the planet is encoded in DNA. We know the stuff can hold a lot of information. But how much is a lot? We could theoretically encode the world’s data (from emails to albums, movies to novels) on just a few grams of DNA. DNA already preserves life itself—now it might also preserve life as we live it. According to New Scientist, a gram of DNA could theoretically store 455 exabytes of data. And Quartz drives the point home. If the world has about 1.8 zettabytes of data, according to a 2011 estimate, all the world’s information would fit on a four-gram DNA hard drive the size of a teaspoon. 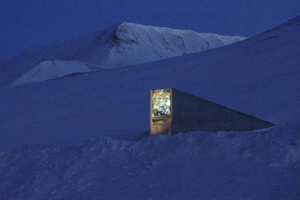 Svalbard Global Seed Vault in Norway. But why choose DNA (other than its massive storage potential)? Because in the right conditions, DNA can survive for thousands of years. Long past the time traditional hard drives have degraded. Scientists at the Swiss Federal Institute of Technology in Zurich set out to find out just how long DNA might last. Encapsulated in tiny, dry glass spheres, the researchers say that DNA kept at a temperature of 10 °C would remain uncorrupted (and the data readable) for 2,000 years. At even lower temperatures—like those kept at Norway’s Svalbard Global Seed Vault—the data’s longevity jumps to two million years. But here’s the kicker. Preserving data in DNA is very, very expensive. The Swiss researchers encoded 83-kilobytes, the medieval Swiss federal charter and Archimedes Palimpsest, at a cost of $1,500. There are a nearly two quintillion kilobytes in the world’s 1.8 zettabytes. We could mortgage the global economy—and still be woefully short of cash. But it’s a pretty fascinating idea. More research and improving techniques may bring the cost closer to Earth. And of course, in practice, we would be far more judicious about what information we encode—using the technique as a time capsule or the ultimate backup for the modern world’s most critical information. Learn more about preserving humankind’s data on DNA hard drives at Quartz and New Scientist.